Meigs County Sheriff Keith Wood speaks during a press conference on Thursday regarding the Gallia-Meigs Task Force. Also pictured, from left, are Meigs County Prosecutor James K. Stanley, Gallipolis Police Chief Jeff Boyer, Middleport Police Chief Bruce Swift and Gallia County Sheriff Matt Champlin. ROCKSPRINGS — Five years ago local agencies teamed up with the Ohio Attorney General’s Office to form the Major Crimes Task Force of Gallia and Meigs Counties in an effort to better combat the drug epidemic and other crimes in the area. On Thursday, representatives from the agencies involved held a press conference to update the public on the work of the task force since its beginning. The Major Crimes Task Force of Gallia and Meigs Counties is made up of authorities from the Meigs County Sheriff’s Office, Gallia County Sheriff’s Office, Gallipolis Police Department, Middleport Police Department, Ohio Bureau of Criminal Investigation, Gallia County Prosecutor’s Office, and Meigs County Prosecutor’s Office. Since its formation, the task force has opened hundreds of investigations leading to the seizure of an estimated $7,896,000 in illegal drugs, such as heroin, fentanyl, cocaine, methamphetamine, and marijuana. More than 200 people have been convicted on charges stemming from task force investigations. Task force members have served nearly 250 search warrants and seized drug proceeds in the amount of approximately $400,000 in cash. Meigs County Sheriff Keith Wood, Gallia County Sheriff Matt Champlin, Meigs County Prosecutor James K. Stanley and Deputy Attorney General for Law Enforcement Stephen Schumaker addressed the media regarding the efforts of the task force. Schumaker commended the work of the agencies and individuals involved, stating that they have worked to send a message for dealers to stay away from the two counties. Wood noted that the collaborative effort has allowed for things to be accomplished which could not have been done by the agencies working alone. At the press conference, Wood noted that the task force not only works to investigate drug crimes, but also with recovery services to get those involved the help they need. “Our relationship with recovery services is second to none,” said Wood. He added that Issue 1, which appears on the November ballot, “scares us as a task force” with the potential to “cripple us.” As previously reported, local officials in Meigs and Gallia counties have spoken out against Issue 1, urging voters to vote “no.” Wood asked that everyone educate themselves on Issue 1 before voting. Stanley noted that the task force is not about sending people to prison, but saving lives and changing lives. “It has changed their lives; it has saved their lives,” said Stanley of some of the individuals brought before the court on drug charges as a result of task force investigations. From the time the person is first brought in to court, until they have either voluntarily or by court order completed treatment, Stanley noted the difference is evident. Champlin, who was first involved with the task force as an officer, and now as a sheriff, noted that the task force has been “hugely successful” while building the relationships and networking to combine resources. Champlin also applauded the efforts of the task force members. Stanley added that approximately 50 percent of the cases presented to the grand jury in Meigs County each month are the result of task force investigations. Schumaker explained that receiving the funding and the creation of a task force such as this one is not something that happens overnight. Before the task force was established in 2013, the proposal was put together by local individuals and agencies, which then presented the plan to the Ohio Organized Crime investigation Commission for consideration. Schumaker noted that they had “great hopes” the task force would succeed and that it has done so. An example of a major case investigated by the task force is that of Antonio McIntosh. The Cincinnati man was sentenced to 33 years in prison after a task force investigation found that he was the leader of a large-scale drug trafficking ring operating out of a Gallia County business. A portion of the information from a news release provided by the Ohio Attorney General’s Office. 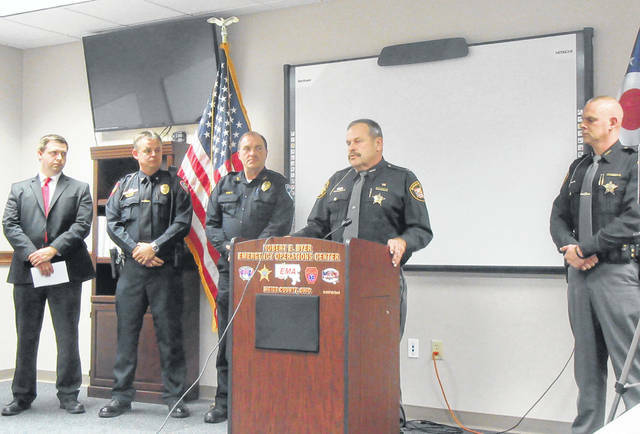 https://www.mydailysentinel.com/wp-content/uploads/sites/14/2018/11/web1_11.2-Task-Force_ne2018111143955601.jpgMeigs County Sheriff Keith Wood speaks during a press conference on Thursday regarding the Gallia-Meigs Task Force. Also pictured, from left, are Meigs County Prosecutor James K. Stanley, Gallipolis Police Chief Jeff Boyer, Middleport Police Chief Bruce Swift and Gallia County Sheriff Matt Champlin.